The same tattered wad of newspaper has been jammed in the keyhole of the front door at White Oak Pottery Studio for 17 years now to keep the bees out. Standing outside of the studio amidst the buzzing bees, the gentle hum of the pottery wheel lures visitors inside. Julie Olson, along with Pete Cozart — whom she has lovingly coined her “house-husband” — own and operate White Oak Pottery in Durham. Both are potters, but Cozart is in charge of cooking, cleaning and organizing, according to Olson. Olson did not always know she wanted to be a potter. In fact, she didn’t like her first pottery class that she took when she was younger. After graduating high school, she attended Olympic College in Washington, where she studied design. One semester, Olson found she needed to fill a gap in her schedule. “I had the choice of either biology or pottery, so, obviously, I chose pottery,” Olson said. Olson quickly fell in love with pottery and has since devoted her time and talent to perfecting the art. She began really honing her technical skills when she received a grant from the United Arts Council of Wake and Orange County in 1997 to attend an eight-week spring workshop with renowned potter Silvie Granatelli at the Penland School of Crafts. “When you’re making something functional, it needs to function, like how you need a sturdy handle on mugs,” Olson said. 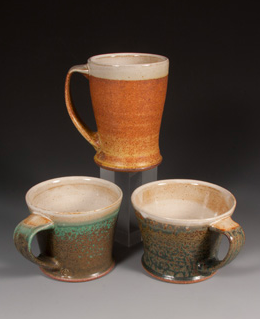 She said one day at the Penland workshop she made more than 60 handles for a batch of 20 mugs. This was valuable experience because it allowed Olson to “worry only if the work was right, not if it would sell,” she said. While Olson may not have to throw 60 handles for every 20 mugs anymore, creating beautiful and functional dining ware is still a timely process. Out of her many mixed media projects, Olson prides herself most on her boxes. Creation of the boxes is a lengthy process in which she throws, alters into shape and assembles each box and lid. After Olson fires them, she adds hinges, chains and glass beads, all of which she crafts in advance. Olson said her boxes are such a unique creation that some customers send them to friends and family in other countries. When she is not in the studio, Olson also spends her times teaching art students. Olson has taught advanced pottery at the North Carolina State University Craft Center for more than 15 years now. In the little bit of free time she has left, Olson showcases her work at art shows and markets in the Triangle area. After doing shows for almost 40 years, Julie and Pete have the process of setting up and taking down booths down to a science. “It takes us around an hour and a half to set up and only 30 minutes or so to take down,” Olson said. Aside from meeting new people, one of Olson’s favorite parts of art shows is trading with other artists. In fact, all of the artwork in Olson’s house is from trading. “I don’t want to bring home a truckload of clay, but instead glass and woodwork,” Olson said. In addition to her unique lidded boxes and functional dining pieces, Olson creates Raku pottery, totem poles and handmade Coptic bound books. While she doesn’t take orders, it is well worth the 25 minute trip down a dirt road to 3915 Rivermont Road in Durham to explore White Oak Pottery’s charmingly rustic farm-shed-turned-pottery-studio. And while the bees may remain outside, there is plenty of beautiful pottery to be admired within.